The enthusiasm for stenting has driven the misplacement of many well intended stents. The problem with stents in the central veins is three fold. First, the typically large stent chosen for placement in the SVC, the Wall Stent, by design expands while shortening but maintains a uniform diameter. 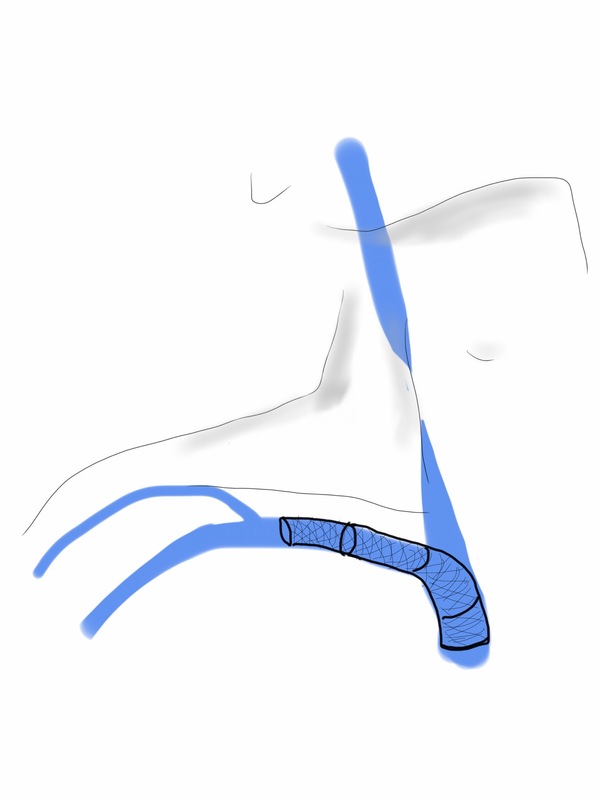 If deployed partially in the subclavian vein, it remains constrained at the smaller diameter and far longer than intended. The other problem is that while ballooning can be done repeatedly, once they are in, stents limit how much can be ballooned as material grows and accumulates rapidly in the stent. There are no FDA approved devices for debulking this material on the venous side (I have asked the laser folks if anyone has used -no). The third challenge is deploying or embolizing into the heart, and this often requires a sternotomy or thoracotomy to retrieve the wayward stent. Unfortunately, you can’t compress the head like you can the legs, and these patients have overloaded their remaining drainage even with 24 hr upright posture. Spandex Lucha Libre masks would not treat the cerebral edema that causes intense headaches and neurotic symptoms. This patient began his problems with effort thrombosis and hypercoagulability, found and treated in his home institution. He underwent first rib resection and stenting, but he rapidly thrombosed his stent despite anticoagulation, and this resulted in more stents until he had stents deployed across the confluence of the left and right brachiocephalic veins. This inevitably occluded and he developed SVC syndrome. He underwent two open bypasses first with vein then with PTFE by his local surgeons but these occluded. When he came, he had the swollen face and conjunctival edema of someone suffering from SVC syndrome. He had been told that there was no more that could be done and he would likely die within the year. He decided to seek a second opinion and made the long trip to the Clinic. The ultrasound and CT showed his stents to be closed, but even after I opened his stents basically by ballooning and putting in more stents (10mm), he still had symptoms. This required an imaginative solution. IVUS by the way is important in these procedures. The procedure to open the subclavian to SVC stents was done via the cephalic vein which was large and patent. Duplex of his neck revealed dilated internal jugular veins and it struck me that I had a good a chance at draining the head with a transposition of the cephalic vein to the IJV. The challenge was how to tunnel this -above or below the clavicle. 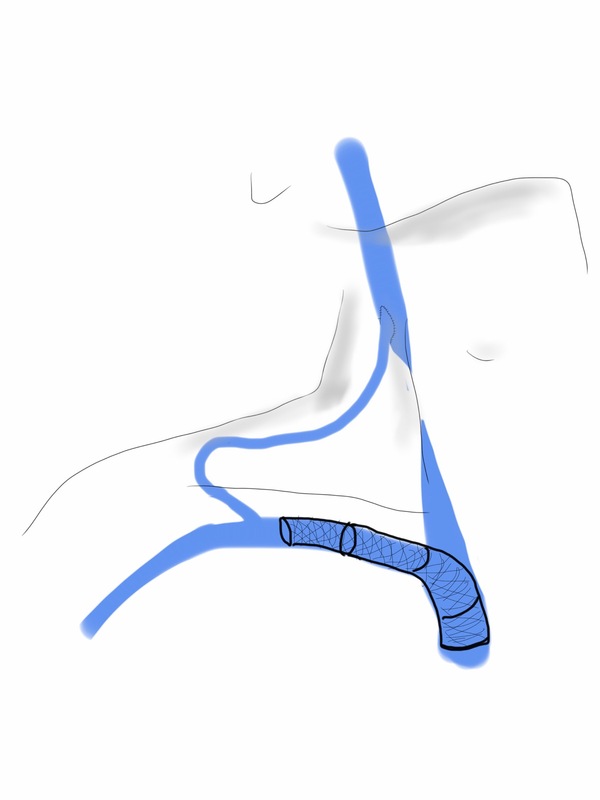 It was not entirely obvious because the superficial tunnel would be subject to compression while the subclavicular route was likely heavily scarred and subject to compression and kinking after turning upward. I chose to tunnel over the clavicle and confirm a good turn of the vein by sending a catheter and wire through it and shooting venograms. The vein was taken from the antecubital fossa up to the shoulder. It was exposed, marked in situ, mobilized, flipped and tunneled to the neck where the IJV was dissected. It was anastomosed to a generous venotomy created with multiple applications of a 5mm aortic punch. This immediately relieved his symptoms, and he did well for about 6 months when he called urgently and drove in because his symptoms had returned. I thought he had closed his transposed vein, but duplex showed that it was his stents that had closed, and that his vein had stayed open. I reintervened on the stent via the brachia veins and his symptoms resolved again, and he remains happy and providing for his family. He will be due for his 1 year followup soon.